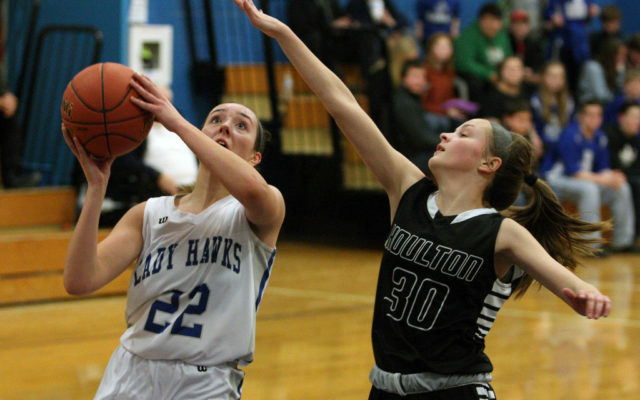 A hot start to Wednesday’s girls basketball contest against cross-town rival Hodgdon propelled the Houlton girls to a 55-33 victory in what was a regular season finale for both clubs. 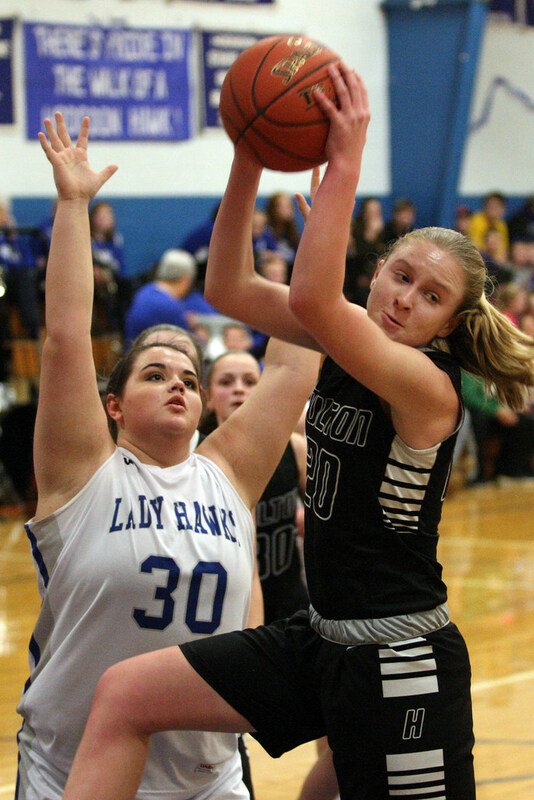 HODGDON, Maine — A hot start to Wednesday’s girls basketball contest against cross-town rival Hodgdon propelled the Houlton girls to a 55-33 victory in what was a regular season finale for both clubs. The Shires (9-9) scored the first 14 points of Wednesday’s game, using a full-court press to pester Hodgdon into numerous turnovers. Teagan Ewings led the Shires with 13 points (10 of which came in the first quarter), while Abbie Worthley added 11, Mia Henderson had eight, Rebecca Howe seven, Kennedy Buzzeo had six; Emma Ardell and Olivia Henderson both had four and Breanne Barton had two. 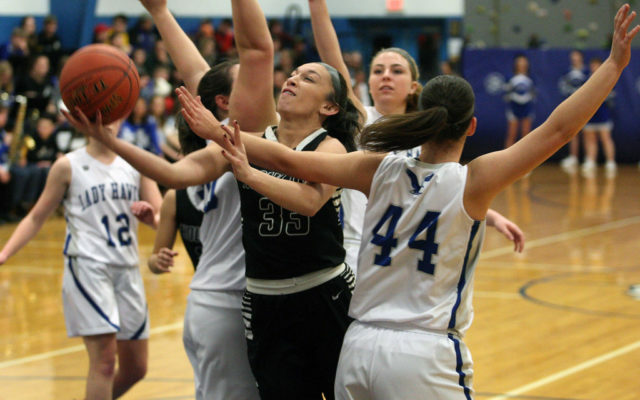 Houlton’s Teagan Ewings, right, comes down with a rebound Wednesday evening while Hodgdon’s Kylee Mooers defends. The Shires beat Hodgdon 55-33. For Hodgdon (10-8), Sabra Scott tallied 10 points, while Emma Drew chipped in eight; Kora Lambert added six; Kylee Mooers had four; Lauren McGillicuddy and Autumn Ganzel each had two and Kaelyn Lawlor added one. The Shires led 16-5 at the end of the first period and took a 30-14 lead into the locker room at halftime. But then the Hawks came out with renewed vigor in the second half, cutting the lead to seven at one point (34-27) with 1:55 left to play in the third period. Houlton clamped down defensively in the final period, holding the Hawks to just six points, for the victory. Both squads must now shift focus to the upcoming postseason as they will each find themselves in preliminary playoff contests. Houlton was ranked seventh as of Thursday afternoon and looking at a prelim game hosting the No. 10 seed (currently Fort Fairfield, 13-4). Fort Fairfield, however, has a big game against Fort Kent Thursday evening, and the outcome could impact their spot in the standings dramatically. Hodgdon, as the No. 12 seed, will be on the road for the playoffs. If the seeds hold, the Hawks would face No. 5 Calais (17-1) in a prelim game. The preliminary round for both Houlton and Hodgdon will be Tuesday, Feb. 12.